ICS technology enables the Pisces to be equipped with built-in donor and service antennas so getting the Pisces up and running is as easy as plugging in the power. With intuitive LED indicators, every mobile phone user can place the PS-2200 at a location with best signal for optimal performance. Simple and complete, the PS-2200 digital ICS repeater is an unique offering for carriers to solve 3G network coverage problems of their clients instantly. Say “good bye” to oscillation problem! 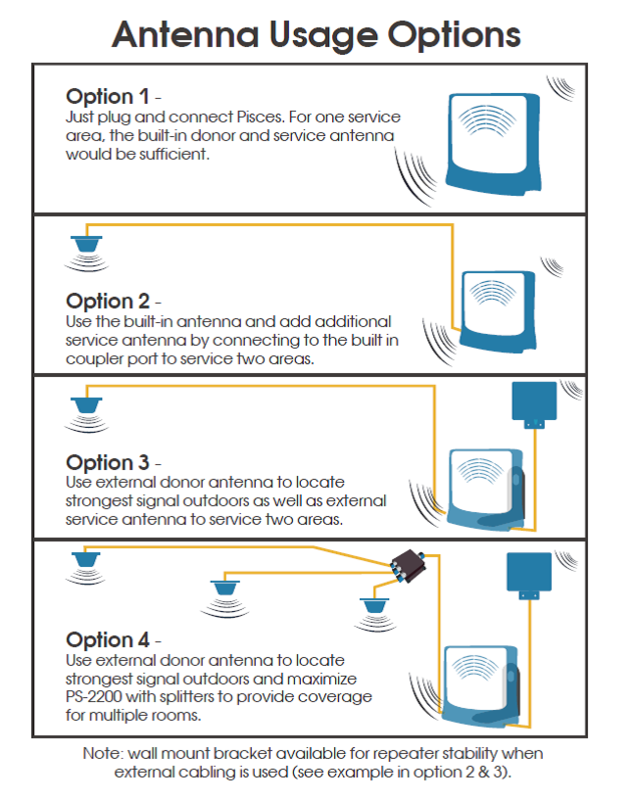 PS-2200’s 25dB isolation cancellation system range makes donor and service antennas within the same unit possible. Should isolation be less than perfect, due to where the Pisces isplaced, Automatica Gain Adjustment (AGA) will adjust the gain accordingly. 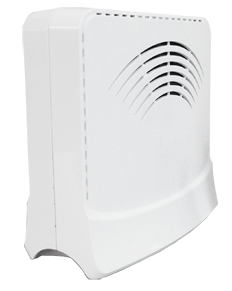 Automatic Gain Control (AGC) function ensures that the unit does not surpass its intended output power and eliminates signal spikes that may interfere with base stations. Configure UMTS channels on PS-2200 via OMT software. Also, monitor isolation, gain and output power in precise numerical values via OMT. Need service improvment in more than one area? No problem! 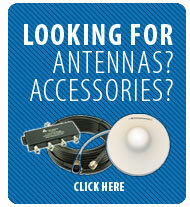 Pisces comes with antenna extension port, so coverage to multiple rooms can be provided by one unit. Should the RSSI level be too weak indoors, built-in donor antenna can be disconnected and external cabling and antenna can be used to locate better signal location. When external cabling is used, wall mount bracket can be used to secure the stability of the unit. Combining 6 dBi of gain from the built-in donor and service antennas and the system module gain of 70dB, Pisces can improve the 3G signal up to 82dB! 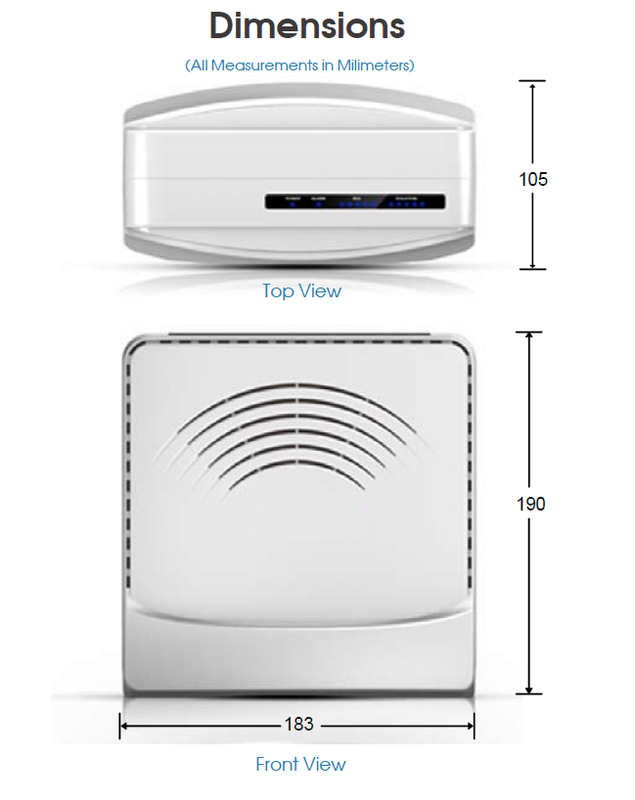 Providing UL/DL output power of +13/+10dBm, it can effectively cover a variety of smaller indoor areas. nstallation has never been easier! Just plug Pisces in and enjoy instant 3G coverage extension. For user convenience, an LED display provides power and alarm status. Additionally, there are two sets of LED to display Received Signal Strength Indication (RSSI) and isolation, so finding the best location for the unit to be placed is really easy.